It’s Spring Training Time for the Orioles! To celebrate Opening Day and Spring Training for the Orioles, we share a few Orioles Collectibles available at Bahoukas Antique Mall and Beer MuZeum. 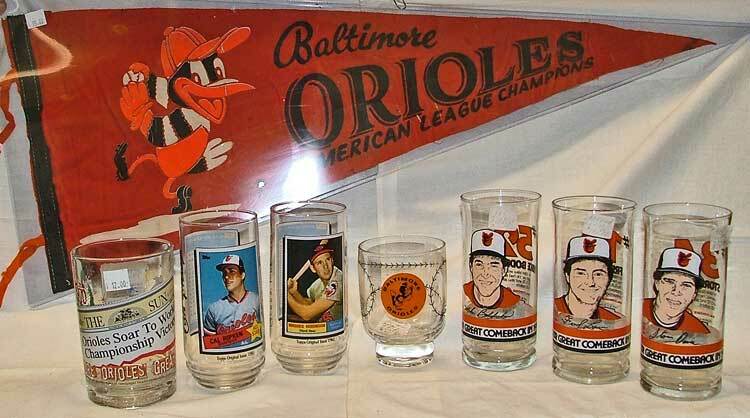 In this photo we have an 1960s Baltimore Orioles pennant, and a selection of glasses specific to the Orioles. So ‘get your game on’ and celebrate Spring with Baseball’s Spring Training! If you’re feeling a bit down about the Orioles this year, check out this article that offers a bit of hope… then stay tuned as the Orioles get to work on their 2018 Season!